44 is an aggressive full court, trap-and-rotate, man-to-man defense. 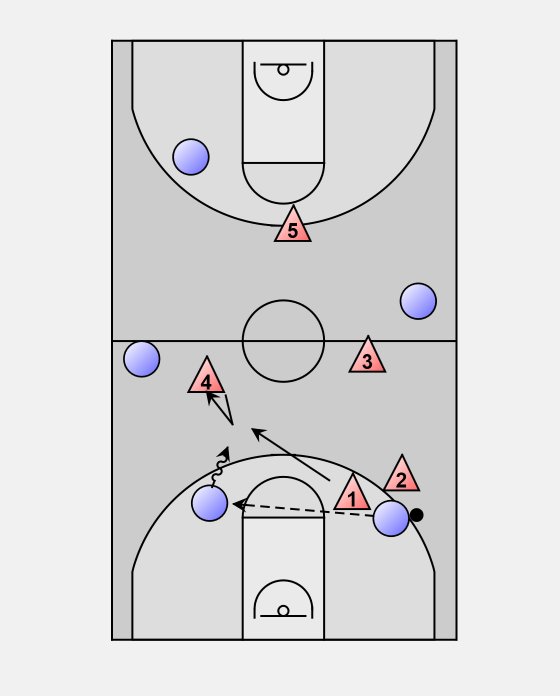 Passing lanes are contested and the ball handler is trapped when possible. Here X2 is at least even with the ball handler and forces the dribble into a sideline "fan" trap. X3 releases from her check when the ball handler is three strides away to complete the trap with X2, coming in with arms extended. X5 rotates to pick up X3's check, X4 drops back as safety in the gap between the two deepest attackers, and X1 denies a pass back to the in bounder. Here the on-ball defender is able to get ahead of the ball handler and stop the dribble at the sideline. As the ball handler reverses her dribble (and has her back turned), X3 comes in from the side to complete the trap. If on-ball defender X2 is behind the ball handler, rather than in front of or even with her, X3 would more likely hedge (fake a trap) to slow the dribbler, then recover to her check. With the "Shadow" option, the inbounds pass is not pressured. The defender of the in bounder (X1) is at the center field position at the ball-side top of the circle. Once the inbounds pass is made center fielder X1 shadows the defender of the ball handler about 8 to 10 feet behind her, denying any pass over the top. From this position the shadow defender can trap, fake a trap and recover to her check (hedge and recover), or jump switch with her teammate. Here a trap is shown. 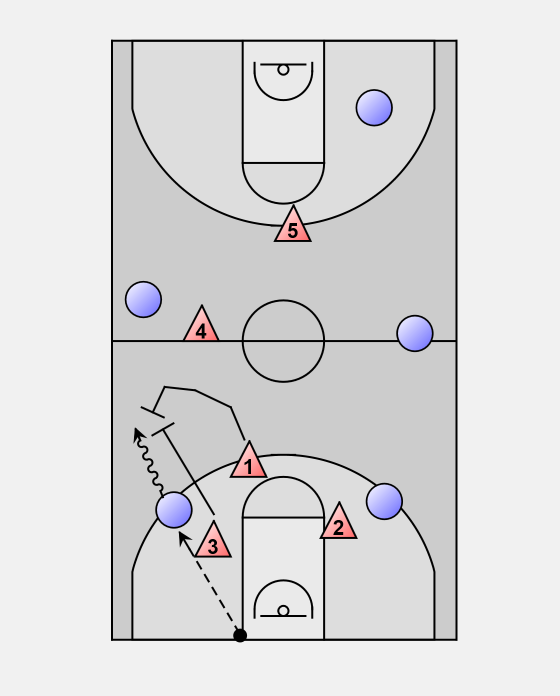 The on-ball defender forces the dribble to the sideline into a fan trap. Defenders X2 and X3 can face guard their checks to aggressively deny the inbounds pass. 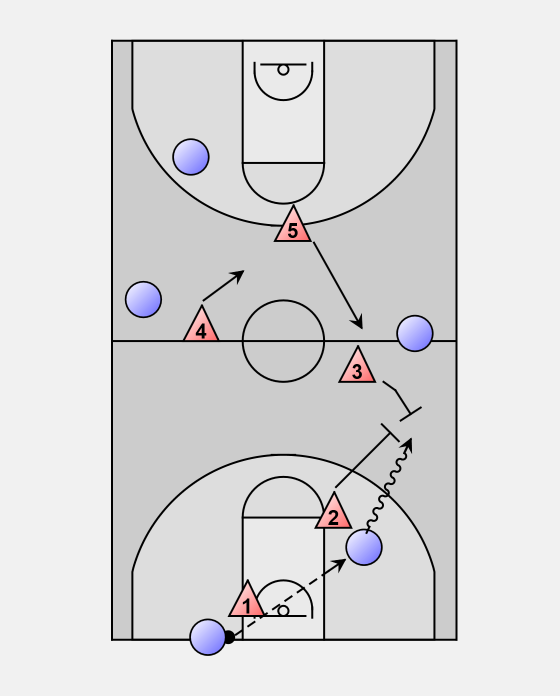 Basic 44 defense forces the dribbler sideline into a fan trap. 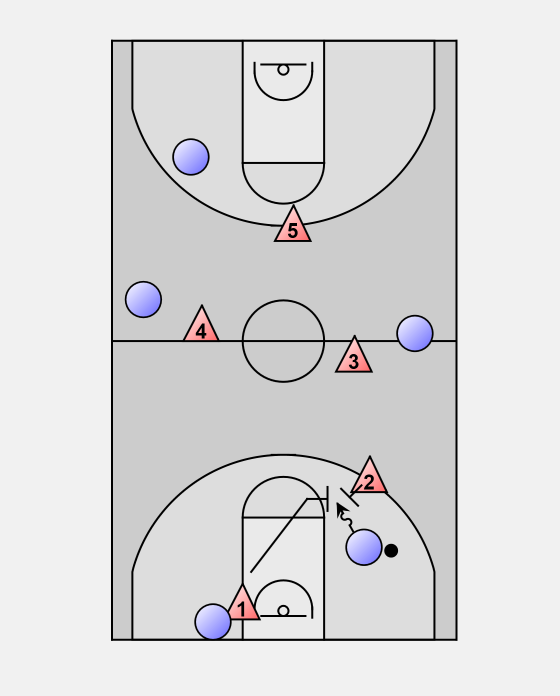 With a "funnel" trap option, X2 forces the dribble towards the middle of the floor. The defender of the in bounder sprint releases to set a trap, moving in the lane of a possible pass back to the in bounder. A funnel trap is more of a gamble than a fan (sideline) trap since the passing angles out of it are better. 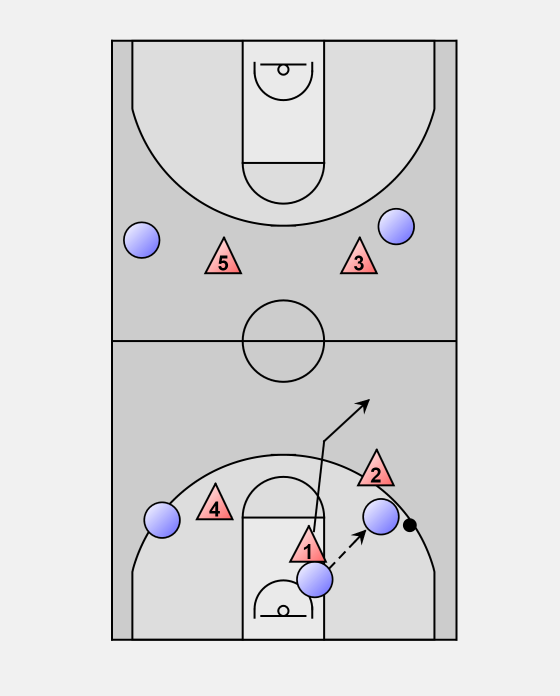 Rather than waiting for the ball handler to put the ball on the floor ("fist"), a quick "blitz" trap can occur immediately on the inbounds pass ("fingers"). Here it is a funnel trap. While this can keep the attackers off balance, the ball handler generally has more options, and time to consider them, before she starts her dribble. The trap can also be faked sometimes to help keep the attackers off balance. If the attackers complete a pass out of a trap, the defenders must recover to their checks as quickly as possible, and be prepared to defend temporarily in a disadvantage (outnumbered) situation. Here when the ball is passed back to the inbounder, nearby defender X4 steps up to slow or stop the dribble penetration, allowing X1 time to sprint recover to her check. In some situations, however, the easiest rotation may be for the trapper to pick up the nearest open attacker. 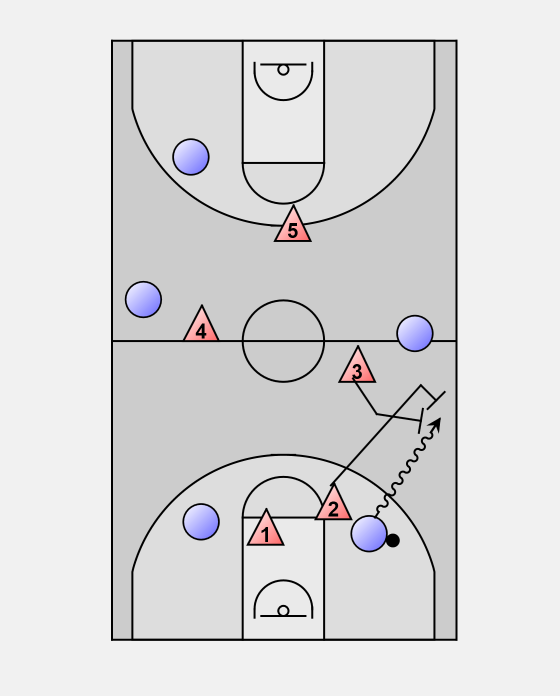 Another coaching option is a "one and done" trap - sprint back into the halfcourt defence if the attackers pass out of the trap, or if the defenders are unable to get in position to set the trap. The final extension of full court trapping is to apply it in missed shot and inbounds situations ("Green"). In either situation traps can be on the sideline or in the middle, and be set on a pass or dribble. On a missed shot, nearby defenders pressure the rebounder and deny outlet passes. 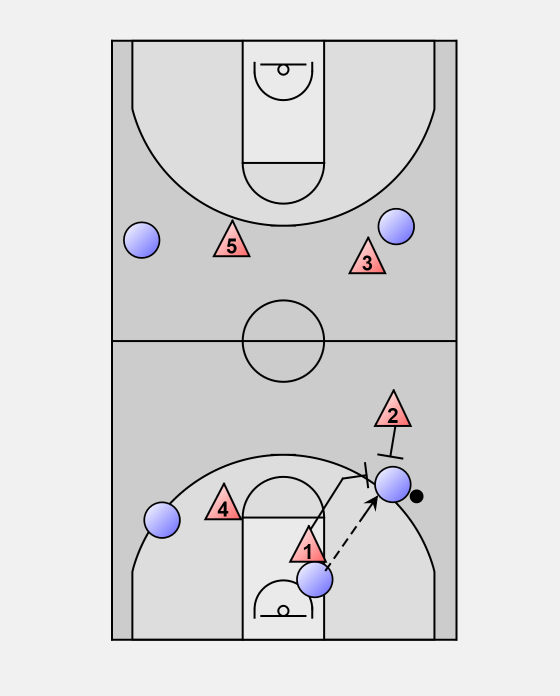 If the outlet pass is made the on-ball defender keeps or turns the ball handler to the middle, and on the pass the defender of the rebounder sprint releases (along the line of a possible return pass to the rebounder) to set a blitz funnel trap. 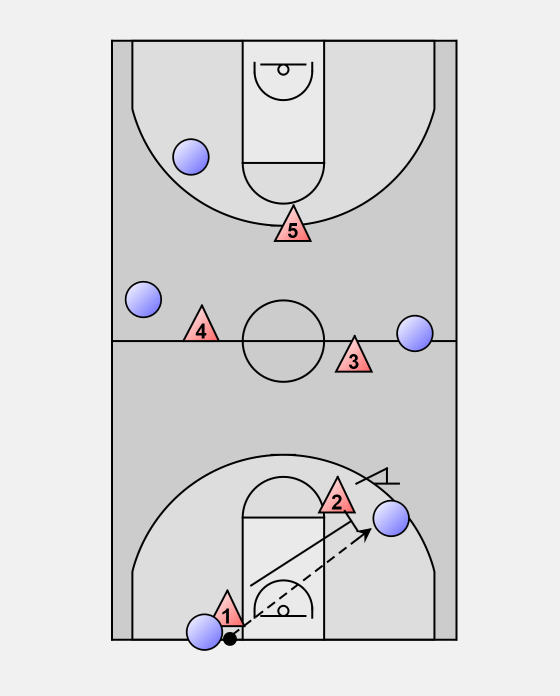 An option is for the defender of the rebounder to run to a shadow position 8 to 10 feet behind the on-ball defender, and then trap, or fake a trap and recover to her check.